ok well.. there are Peaches in it and its just Peachy… ok? I thought it was clever 😉 and yes most of my Gif actors are Vegan… mainly just Depp, Leto & Phenix! at least Ellen thinks I am funny 😉 so back to the Nice-cream… this is a very simple nice-cream… and it takes less than a minute to make… it is delicious!!! Alright so here we GO! You will need to Freeze some Banans overnight to get the “ice-cream” texture you desire! The Peach should just be sliced, skinned and ready to go!!! Put the bananas and Peach into the blender and pulse for a bit so they break up! DO not blend too much as it will become too soft! If you feel like it is too soft, you can put it in the freezer for 15-20 minutes! 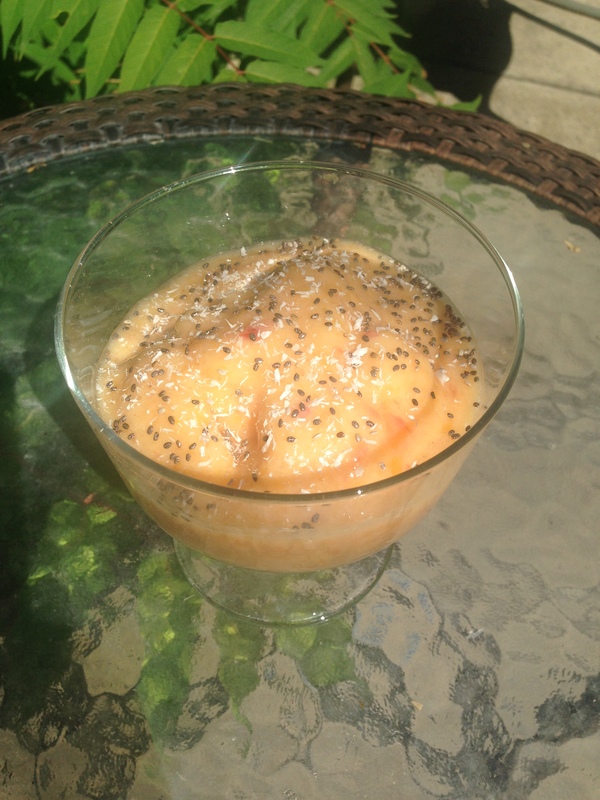 Pour or scoop your Just Peachy Mix in a serving dish, Sprinkle some Chia seeds on top or Coconut shavings and ENJOY! Previous What New Vegans Should eat! wouldn’t that be fun…you can teach me some of the yummy stuff…. Fun things to do as a Vegan.